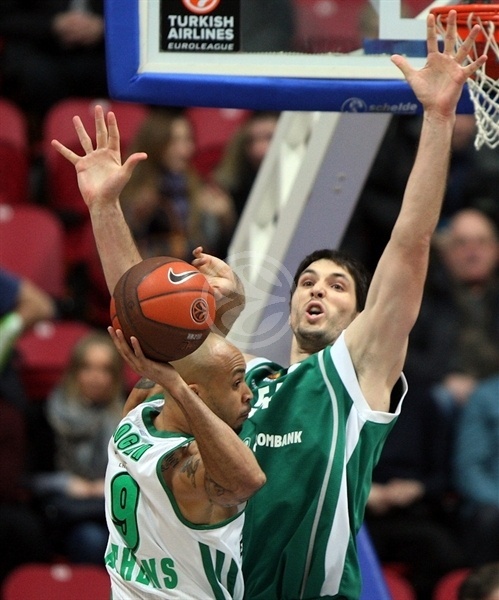 Panathinaikos BC became the Top 16 Group G champion by downing Unics 63-68 in Kazan, Russia on Wednesday night. Panathinaikos was first in Group G with a 4-2 record and will have the home court advantage against Maccabi Electra in the upcoming Turkish Airlines Euroleague Quarterfinal Playoffs. Unics finished Group G with a 3-3 record and made it to the playoffs due to its tie-break advantage against EA7 Emporio Armani Milano. Unics now faces a best-of-five playoff series against Group H champion FC Barcelona Regal. Mike Batiste paced the winners with 12 points. Sarunas Jasikevicius added 10 for Panathinaikos. Henry Domercant led Unics with 19 points. Kelly McCarty added 11 while Mike Wilkinson and Nathan Jawai each had 10 for the hosts, that used a 9-0 run that get within 38-40 at halftime. 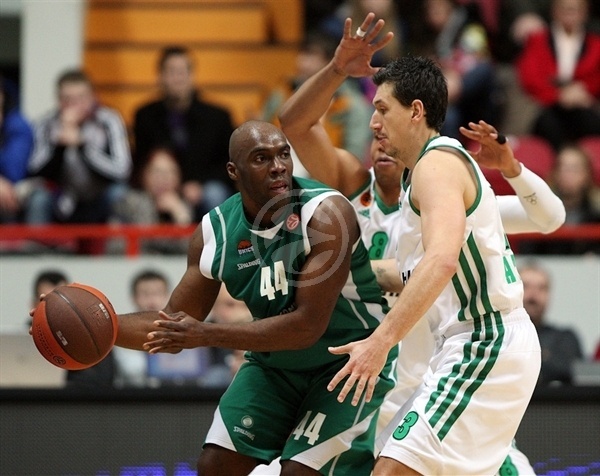 Batiste and Dimitris Diamantidis shined late in the third quarter to give Panathinaikos a 46-52 edge. Lynn Greer and Domercant managed to get Unics within 61-61 in the next-to-last minute but a three-pointer by KOstas Kaimakoglou and free throws by Jasikevicius sealed the outcome down the stretch. Panathinaikos surprised everyone by placing center Aleks Maric in the Greens' starting lineup and leaving Euroleague MVP Diamantidis on the bench. McCarty got Unics going with a second-chance layup but David Logan answered from downtown for a 2-3 Panathinaikos lead. Wilkinson sank a triple in transition but Steven Smith quickly joined the three-point shootout. McCarty buried his trademark corner triple and a driving layup by Logan tied it at 8-8. Jawai hit free throws that Maric erased with a layup. Wilkinson shined with a power basket, as Panathinaikos improved its defense midway through the second quarter. Meanwhile, a three-point play bt Stratos Perperoglou put the gusts back ahead, 12-13. Diamantidis split foul shots and a turnaround jumper by McCarty tied it at 14-14. Diamantidis kept pacing Panathinaikos with a three-pointer but Vladimir Veremeenko scored down and a running triple by Domercant made Unics regain the lead, 19-17. Batiste hit a five-meter jumper and Jasikevicius bettered McCarty's free throws with a bomb from downtown for a 21-22 Panathinaikos lead after 10 minutes. Unics tried a more dynamic frontcourt with Bostjan Nachbar and Veremeenko together on court. Both teams went scoreless for more than 2 minutes until Jasikevicius buried a long jumper. Unics could not find the way to the basket and Jasikevicius send a behind-the-back assist to Diamantidis for a rainbow triple that forced the hosts to call timeout at 21-27. Ian Vougioukas shined with an off-balance jump hook but briefly left the game with an ankle problem. A free throw by Batiste capped a 0-12 Panathinaikos run, as Wilkinson hit a mid-range jumper. Jawai followed that with a slam that brought Unics within 25-30. Kaimakoglou hit a four-meter jumper that Domercant erased with a floating layup. Batiste split free throws and Jasikevicius struck again from downtown to make it a nine-point game, 27-36. Jawai scored off a wild spin move but Batiste buried a jumper and Sato added a backdoor layup to give Panathinaikos a 29-40 edge. Domercant and Wilkinson took over with back-to-back three-pointers to bring Unics back to life, 35-40. Free throws by Domercant brought Unics even closer, 38-40, at halftime. Panathinaikos excelled in defense after the break, forcing Unics to be scoreless for more than 4 minutes. Meanwhile, a floating layup by Logan made it a four-point game, 38-42. Sato took over with a fast break slam that forced head coach Evgeny Pashutin to stop the game at 38-44. Lynn Greer tried to change things with a floating layup that Batiste matched with free throws. McCarty buried a mid-range jumper but Batiste insisted with more fouls, as the Greens kept running their offense through him while Diamantidis was resting on the bench. 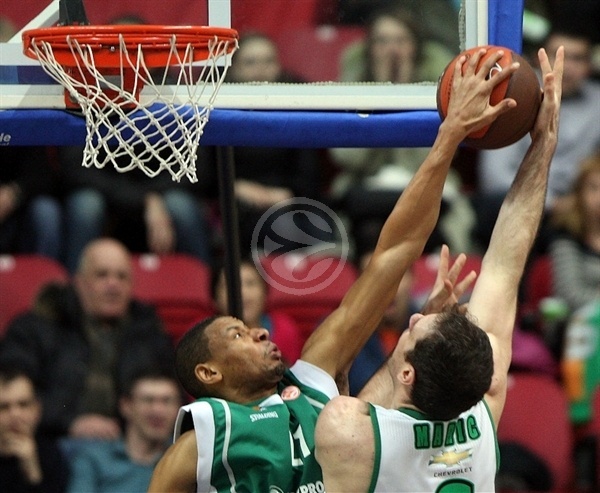 Unics had severe problems to circulate the ball against the guests' well-adjusted defense. Veremeenko stepped up with an off-balance put-back layup. 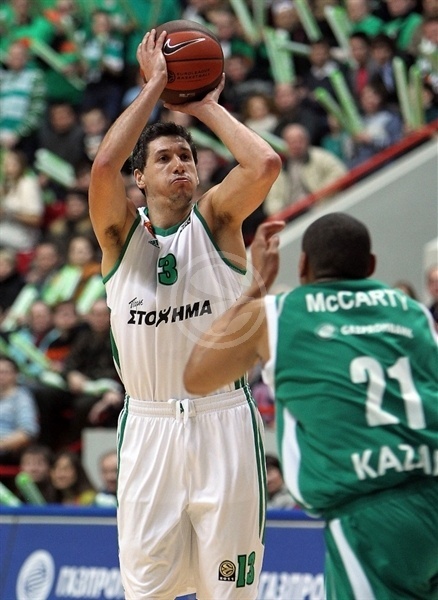 Diamantidis returned to the floor but Panathinaikos kept committing turnovers. Meanwhile, a second-chance basket by Veremeenko brought the hosts even closer, 46-48. Batiste scored down low and free throws by Diamantidis gave Panathinaikos some fresh air, 46-52. Greer provided a highlight with a tough jumper to keep Unics within 48-52 after 30 minutes. Domercant swished a jumper that made it a two-point game, 50-52, early in the fourth quarter. Kaimakoglou answered from downtown but Domercant also downed one from beyond the arc for a 53-55 score. Maric shocked the crowd with a put-back slam and soon dunked it again for a 53-59 Panathinaikos lead with over 7 minutes to go. Nathan Jawai set the crowd on fire with a huge alleyoop slam but Maric found space for another uncontested dunk and free throws by Kostas Tsartsaris boosted the Greens' lead to 55-63. 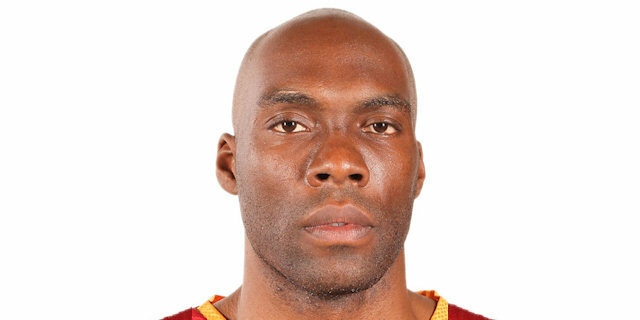 Domercant took over with a wild three-pointer off the dribble, as Panathinaikos struggled to score midway through the fourth quarter. Meanwhile, a layup-plus-foul by Greer brought Unics as close as 61-63 with 3 minutes left. Unics committed 2 key turnovers and Greer missed a go-ahead shot from downtown. Kaimakoglou stepped up with a critical three-pointer that made Unics call timeout at 61-66, with 1.12 left. Free throws by Jasikevicius made Panathinaikos celebrate a big road win that allowed the Greens to win Top 16 Group G! "We played very well today. We were controlling the game and trailing by just 2 to 4 points. It was a tough game against the current Euroleague champion and I believe we competed pretty well. My players did a good job. Now we have got some food for analysis and some time to get prepared for the coming clashes. I’m pretty pleased with the way we played defensively today, however our opponents also knew how to play in defense. The game was a great experience for us. We lost, though we qualified to the top 8. This is an achievement indeed, but we don’t want to stop yet. We will prepare for the coming games and we are looking forward to playing Barcelona." "We have expected a very difficult and a very tough game, because we know, that Unics is a very good team and we had the experience of playing them in Athens. They really know how to play, using players in the right way. 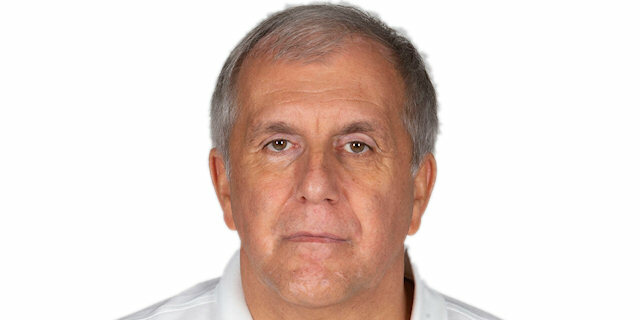 I would like to congratulate my colleague [Coach Pashutin], who has done a great job. Judging upon the first game in Athens, we guessed that the key in this game would be defense. So we were supposed to change the defense in order to win tonight. I believe we played great defense tonight. 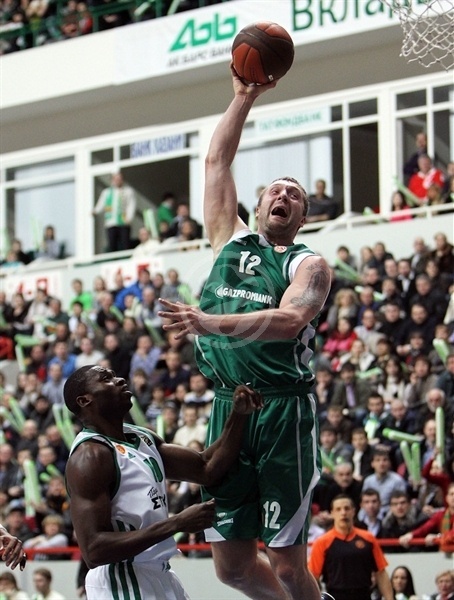 For Unics it was a very difficult situation, because they played without Lyday, who is very important for them. Congratulations to my players. We are first in our group and we will have the advantage in the playoffs. I’d like to congratulate Unics as well, because they are in the top eight, which is a big result for a debutant. " "I would like to congratulate our opponents for the win. They did a good job today. We expected a tough game, and it met our expectations. In the fourth quarter Panathinaikos played better in defense and we were not good enough in offensive rebounding. In other words, Panathinaikos won, because they were better."